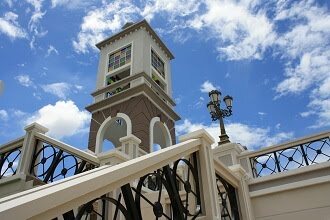 There are more and more restaurants & retail shops opened in De Garden Mall. Anyway, I find restaurants are more attractive then retail shops. It is true that restaurants over here with cozy environment & nice food are good places for gathering with family or friends. I just met new friends here in a newly opened Hong Kong style restaurant, Tong Yan Kai (唐人街) and had very good conversation about blogging life. However, a bigger crowd would simply annoy the nearby residents due to traffic congestion & irresponsible parking. There are several signboards of "no parking" put up at adjacent residential streets but I still see many drivers are ignoring the restriction and causing inconvenience by parking along roadside that narrowing the driving path. 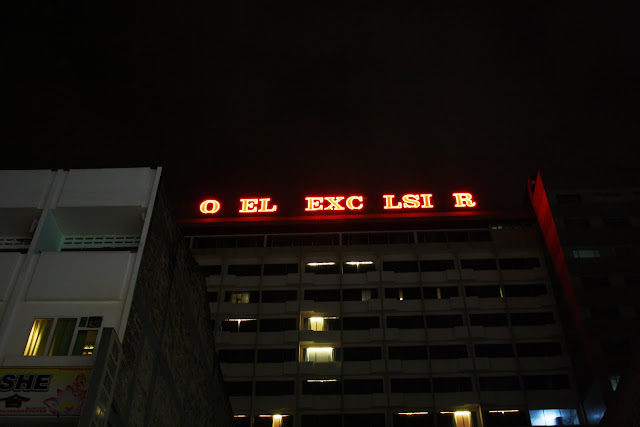 If you would like to know more about Hotel Excelsior, you may check the following details. 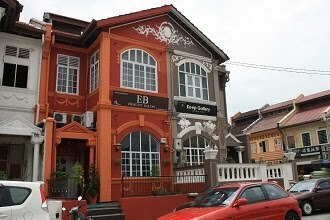 43, Jalan Sultan Abdul Jalil, 30300 Ipoh, Perak, Malaysia. 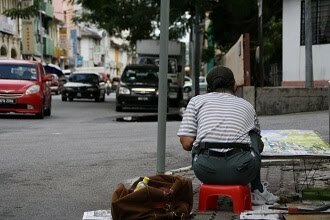 Sunday is a non working day for most people, as well as foreign workers. 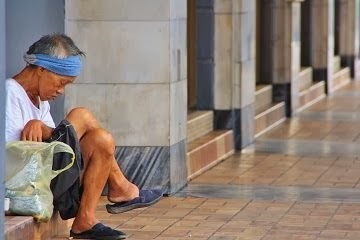 Many of them originated from other third world countries and staying far away from home to earn for better life in future. I was walking along Hugh Low Bridge and found this guy, whom I believe is a foreign worker, was fishing at Kinta River. May be many would think the polluted river is hardly to get fish, but after I watched for less than a minute, he has got one caught. I was wondering how many more fishes is possibly in the plastic bag beside him. Anyway, instead of hanging around in town during off day, choosing to make use of any available time for benefitial activities is a positive way of living. 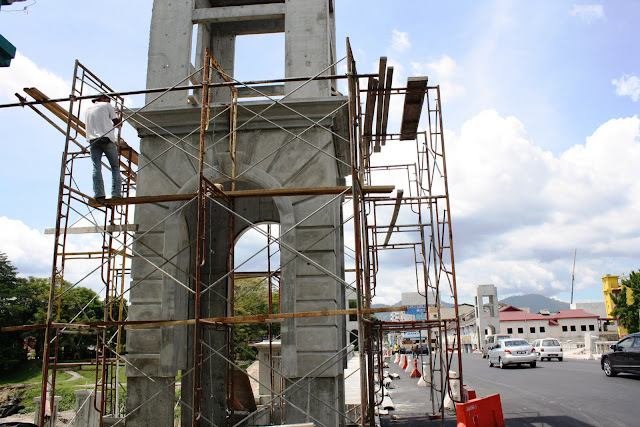 There is no update on Lam Looking Bazaar restoration in this blog since 4-Jan-2010. The building work is completed & I see the first occupant, probably is the anchor tenant, namely Sew Cheong, has moved in. As far as I know, this is a Chinese traditional medical trading company that originally operating in Hugh Low Street. Lam Looking Bazaar is now entering a new chapter. 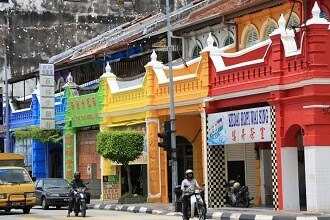 I believe a lot of Ipoh citizens hope to see the bazaar to regain its shine like in the past glorious era. However, I find the name of Lam Looking Bazaar that engraved on building has been removed (you could refer photo in the post dated 21-Jan-2009). And the restoration has made it too "new", people who do not familiar with its history may think this is just another new building. Stone lantern is a unique feature in Japanese landscape garden. 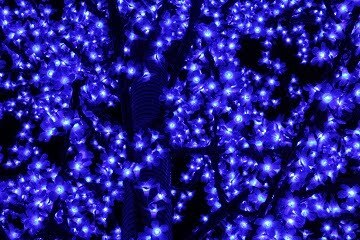 It appears in many styles as a decorative item in the garden and is very charming when lightened up at night. Normally the stone lantern stands among green plants or beside the pond. Some designs are simple and neat, but there are also carved with animals, plants or characters. The Japanese Garden in D.R. 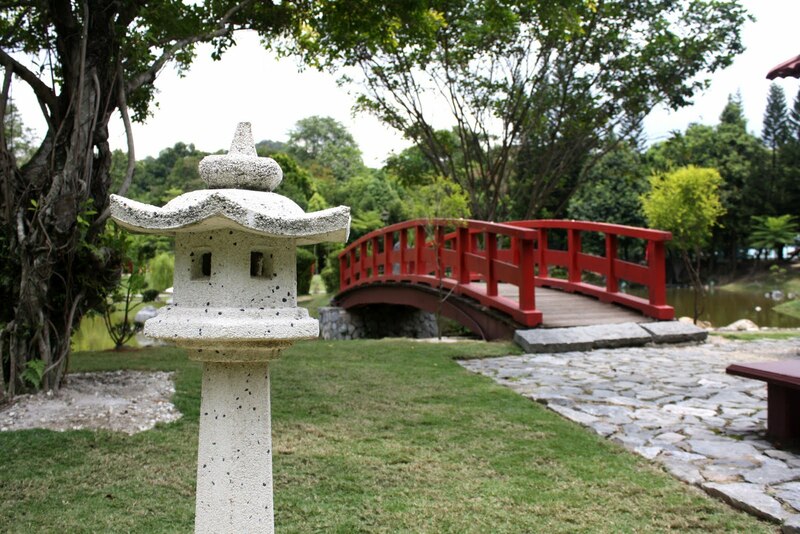 Park which is a joint development by Ipoh and its sister city, Fukuoka, has these beautiful stone lanterns. 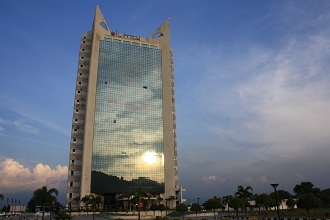 Bougainvillea Building is the only high rise building in Ipoh that uses glass wall. Although it is only 10 storey in height, the building seems to be displaying most modernized design in the city. The glass wall on three of four surfaces of the building sometimes reflect beautiful color of sun rise and sun set. It was mainly occupied by a famous IT college upon completion until few years ago. 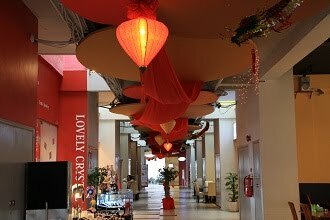 Currently it is still linked to IT industry where a computer & IT company, Kinta Digital World, is occupying the lower floors. It was raining last night. The sky seen to have thin clouds remaining in the morning. 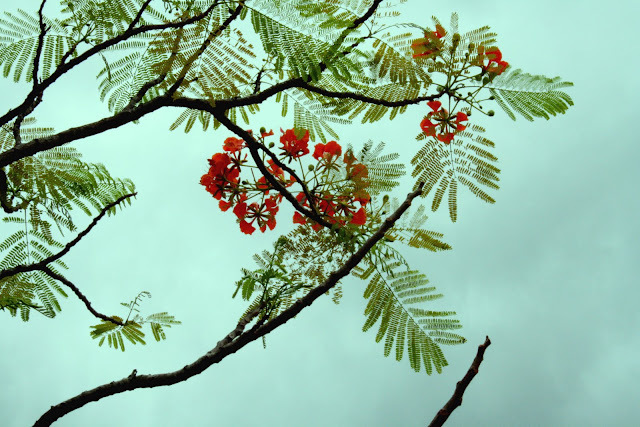 This is always a nice moment that I enjoy the cool breeze, bird singing, swaying leaves & beautiful sky color. I am lucky to see a group of birds flying over me but I have too little time to adjust the correct camera setting and only managed to capture a blur image of the birds. 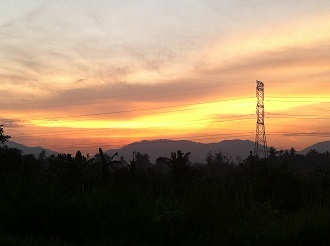 Anyway, I still feel grateful to see this beautiful start of a day and hope this will be another nice day to go. 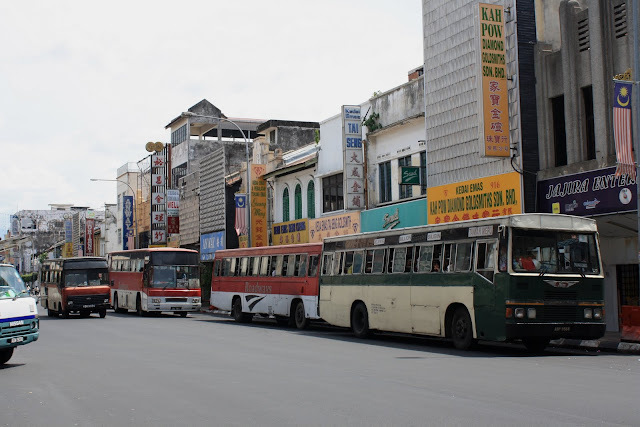 Some Ipohites may have noticed since several months ago there are some new air conditioned buses named "Perak Transit" (in pink color) start servicing the public for the route between Ipoh and Kuala Kangsar, which is considered as an inter-town line. Recently, there are more new Perak Transit buses in blue color running on the road occupying some intra-city routes. 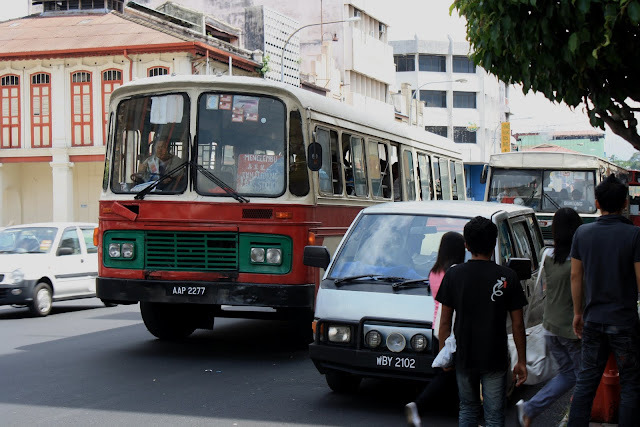 It seems the public transport in Ipoh will undergoing some upgrades. Hopefully this does not end up in similar fate as the previous Citybus (about 13 years ago), where air-conditioned buses did not grow further to replace all aging buses, instead slowly downgraded to non air-con and most of it eventually missing in action. However, these 30-year old monsters are surprisingly still running on the road. We can see these old buses are lining up at Hugh Low Street carrying passengers to every corner of the city. 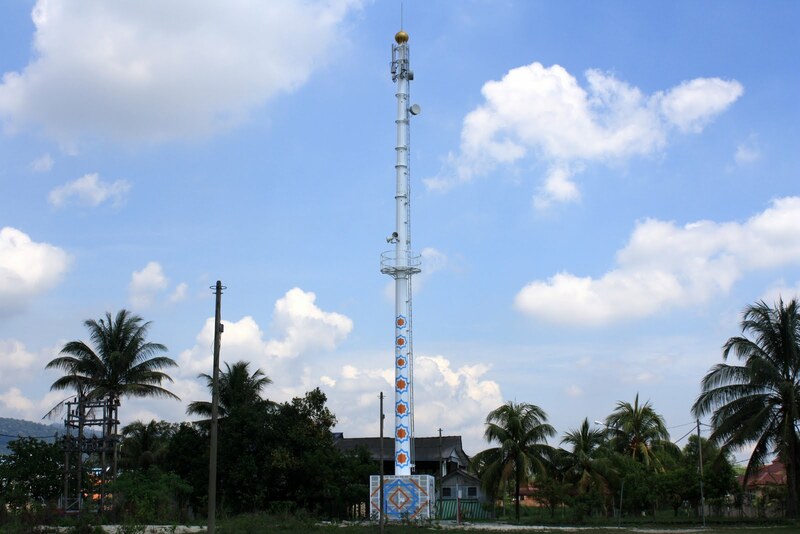 I believe drivers who ride along Raja Perempuan Mazwin Road will notice this telecommunication tower at the session near First Garden. It appears to be a typical telecom tower but come with a very different coating. Instead of painted in usual red and white, it's only coated in white and decorated with several colorful Islamic patterns. I also found the little golden Islamic dome on the tower top and some loud speakers on tower body. I then realize this should be also a minarets of mosque. It was raining for more than two hours in the afternoon. The heavy rain has created some little swallow ponds at the field. 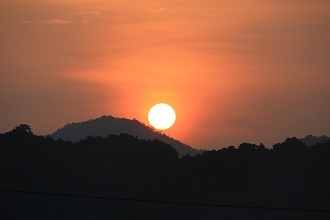 It reflects the beautiful color of sunset. 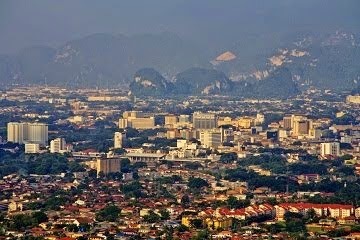 Perak state is commonly known as the silver state in Malaysia ("perak" means silver in Bahasa Malaysia). Today's sunset appears to be silvery and become a nice background to the silver state's administration center, state secretariat building which carries the remarkable great purple roofing. With more and more shops opened in De Garden Mall, car parking becomes a major concern to this hottest complex of shopping and dinning. The congestion has extended to the nearby shops and housing area. Even a small piece of land has to be utilized to build a multi storey car park. This 5-level car park may help to relief the high demand of parking lot but it may not completely fulfill the need with its limited capacity. Since De Garden, Kinta City & Tesco are located adjacent to each other, pedestrian overhead bridges can be the link to distribute the load among these shopping malls. 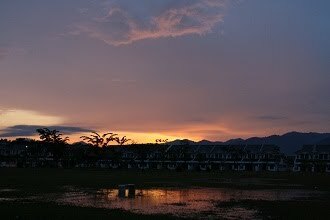 There was a master development plan of Ipoh that covers up to year 2020 being published and opened for public view few months ago. As reported in the newspaper, there was a question about where exactly is the current Ipoh's city center. I am confused with this question. 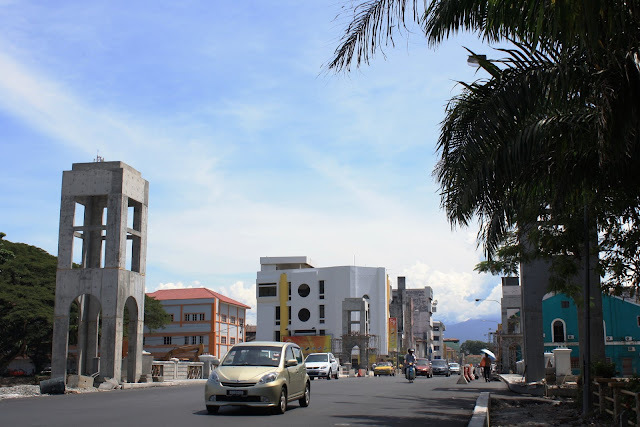 In my opinion, although the city boundary has expended tremendously and the most intense commercial developing area now is Ipoh Garden, but I believe the city center has not changed to most Ipohites. In fact I find this telecommunocation tower at Cockman Street is nearly the center point of downtown and it's taller than any other surrounding concrete buildings. 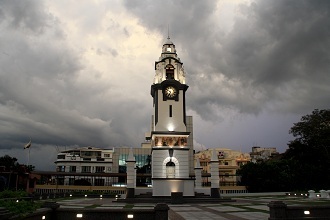 Even though this is not a remarkable structure, but I believe it can be upgraded & beautified (especially with lighting effect) making it a landmark. 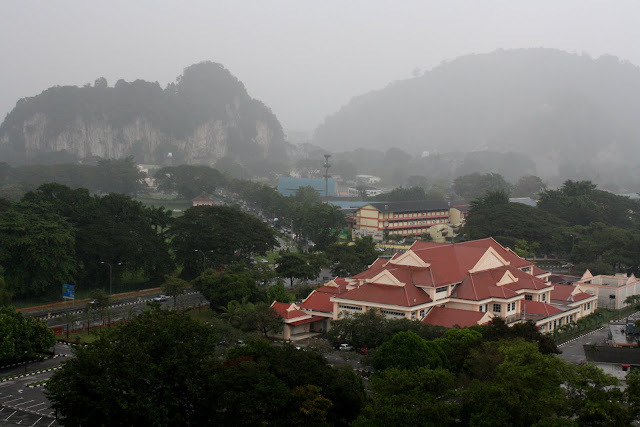 Limestone hill is a natural treasure of Ipoh. It not only supports the cement industry but also provides beautiful scenery as tourism spot. 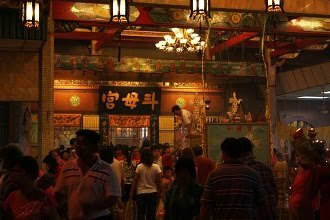 The best known places must be cave temples, such as Perak Cave & Sam Poh Tong, that have been established for more than half a century. 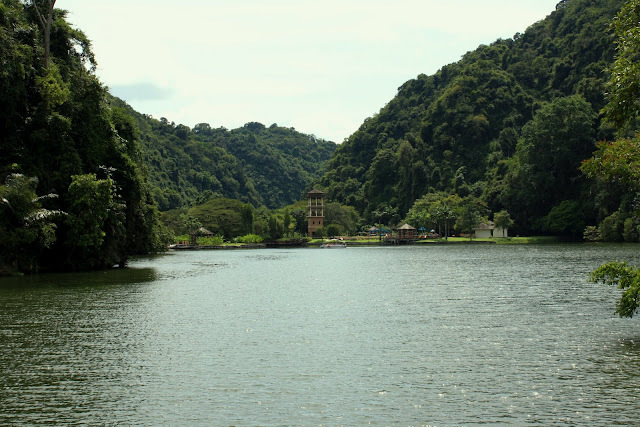 The latest developed spot should be Gunung Lang Recreation Park. It's entrance is just few hundred meters from Northern Ipoh exit of North-South Expressway (and you may find the great sign IPOH is just on top of the hill at entrance). After driving about a kilometer, passing by a temple called Dragon Head Rock, the recreation park appears on the right. There is a beautiful lake surrounded by limestome hills. There are more features at the other side of the lake, including an observation tower. Admission to the park is free but it charges reasonable fee for crossing the lake by boat. This is a very nice place for the citizen to enjoy refreshing air and relaxing atmosphere in this beautiful environment. 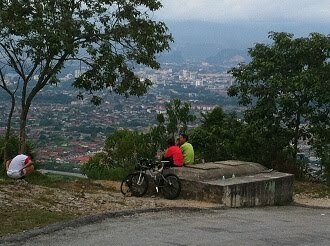 Publicity of the park is still not effective as I find even some Ipoh citizens are not aware of this place. Hopefully it will be made known nationwide, or even worldwide so there will be more people able to enjoy their visit to this beautiful park. Light bulb in the past might not be bright enough to lighting the street from lamp post at roadside. Therefore some were hung over the street. With better & brighter bulb being developed, street lights nowadays are powerful enough to shine from road shoulder. Hanging street light is slowly phased out and I currently don't see anymore in town. 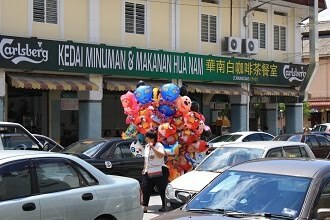 However, to my surprise that I have missed out this one, probably the last of its kind in Ipoh, hanging above Osbourne Street (session between Hume Street & Hugh Low Street). 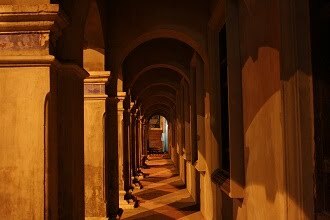 I have even published a post on this row of shophouse in 16-Feb-2010 but this little light simply slipped through my sight. The last piece I saw was also at Osbourne Street, near the junction with Yau Tet Shin Road (at the side of Lou Wong Bean Sprout Chicken Restaurant 老黄芽菜鸡) but was removed decade ago. I am pretty sure this light is not functioning now but I hope it will be preserved and well taken care off. I will pay more attention to look for this kind of hanging street light to find out whether there are anymore surviving in town. When the old Hugh Low Bridge closed during August last year (as shared in 8-Aug-2009 and 14-Aug-2009), it was planned to be replaced by a new bridge within 15 months that able to withstand the increasing traffic. After the old bridge demolished, a temporary military bridge was built next to it to maintain the traffic of Hugh Low Street between Old Town & New Town. The construction of basic structure when I visited the site on 12-June-2010 was almost completed. And about a month later, the new bridge is opened to public due to the army wanted to retrieve the temporary bridge. Anyway, the work is not fully done. There are additional items to be installed which include the original Hugh Low Bridge feature "cross-circle" (or "XO") barrier and four new towers at both end. I took a closer look on the iron XO barrier and compared with some old photos, I believe they are preserved from the old bridge, whereby the towers are something new. From the half complete structure, we already can see the new bridge is designed in western style. The decoration is not only limited to street visible surfaces but also on the river visible side. Now it looked much better from the river bank and I like the color applied on it. 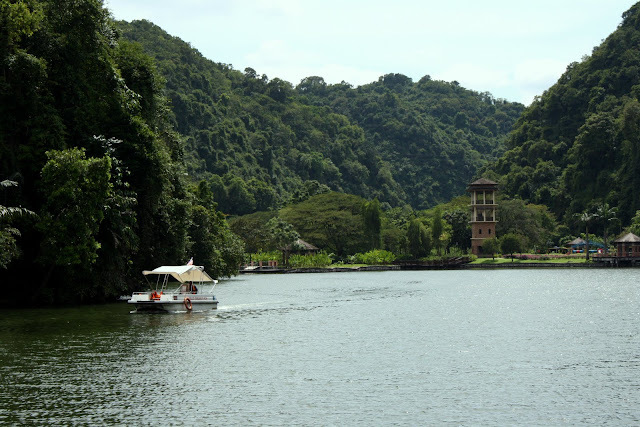 This may be part of the plan to beautify Kinta River and make it an attractive tourism spot. 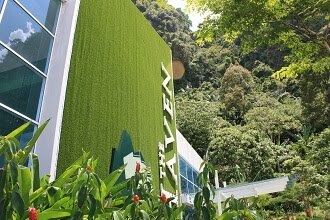 There are more and more hotels opened in Ipoh. Most of them are middle-ranged with daily rate starting from RM80. 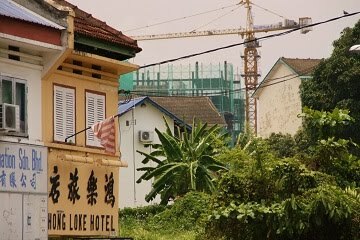 A newest one I find is this, De Hotel at Ipoh Garden (could it be an effect of the newest shopping arcade in town, De Garden, that lead to this hotel name? :-) ) which opened in October. 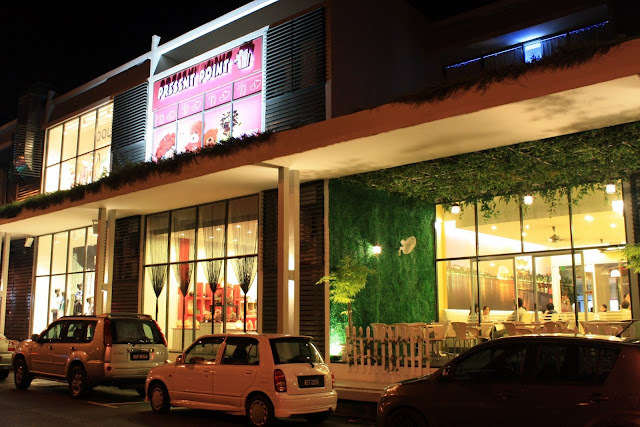 It is located right beside Ipoh Garden Lau Pak Khuan Road roundabout, next to the Ipoh Garden post office and opposite to Wolley Building (CIMB Bank - Ipoh Garden Branch). This 4-storey commercial building completed about 2 years ago and the first tenant is Hoi Seng Chinese Restaurant which occupies first floor of east wing. The majority portion of the building was left vacant until the famous chain store of electrical goods, Courts moved in and taking up spaces of 2 floors during March. 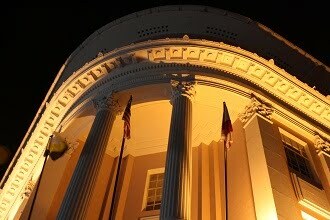 It also turns the building theme color from grey to blue, as seen at photo below. . It is certainly out of my expectation that the remaining floors would become a hotel. 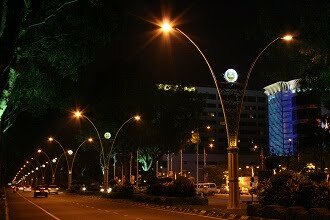 Anyway, it's location at the heart of Ipoh Garden's commercial center is nice & convenience as there are banks, coffee shops, fast food restaurants, food courts and many other shops at walking distance from the hotel. 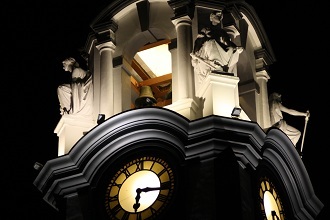 Looking at the hotel exterior, it gives me a good impression to be a well-established one. 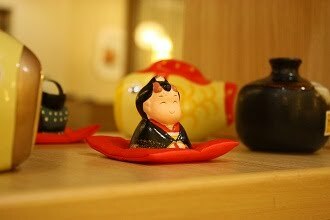 I do not find an official website of the hotel but there is more information about this hotel in the blog of "From Emily to You". 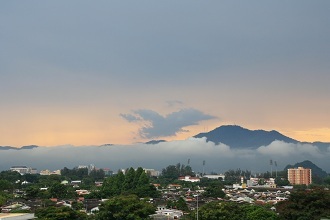 The highest point of Titiwangsa Monutain Range, Mount Korbu, is just one of the peaks seen in this photo (I think is the one covered by clouds at right). 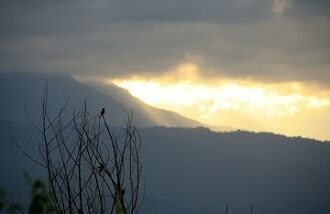 Mount Korbu achieves height of 2,183m above sea level and is the second tallest mountain in Peninsula Malaysia. 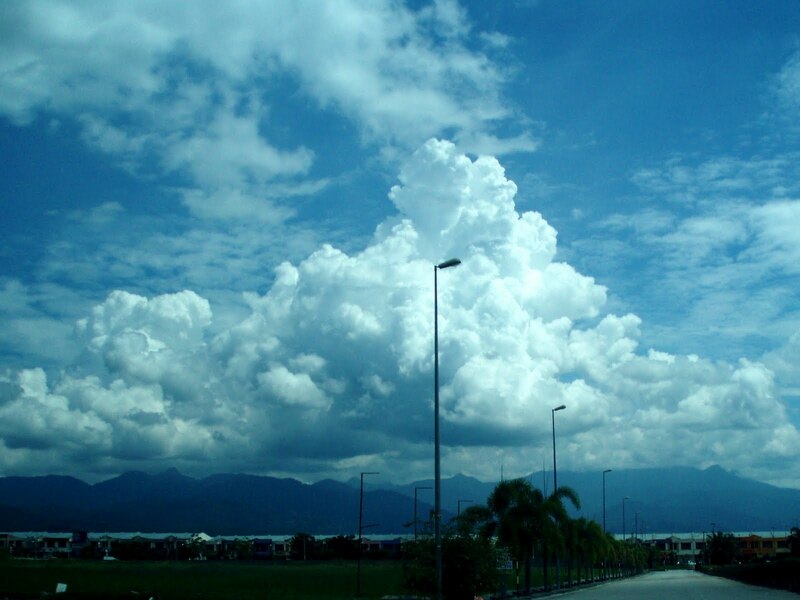 However, the lump of cloud that formed above it simply looked like another giant mountain which is more than double the height of Titiwangsa Mountains. I have seen this mountain of clouds appear on top of Titiwangsa Mountains for several times. 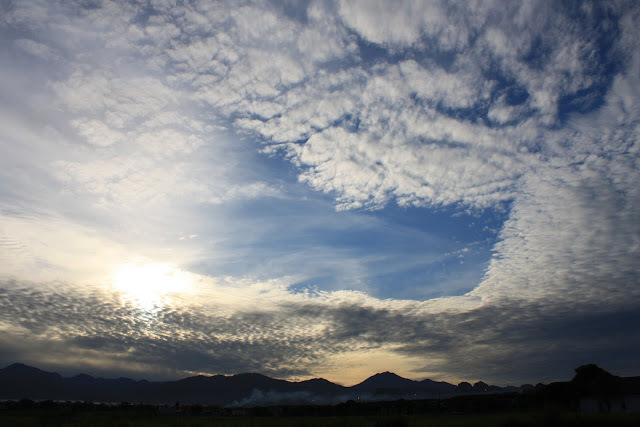 I believe this geological backbone of Peninsula Malaysia is influencing the air flow in atmosphere and causing the formation of cumulus clouds above it. This is the side wall of a old shophouse in Old Town Leech Street. 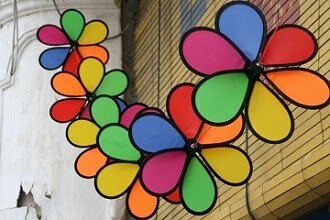 It has the butterfly-shape pattern on it which can be found in many old shophouses in Malaysia. It looked like four circles when seen at far. 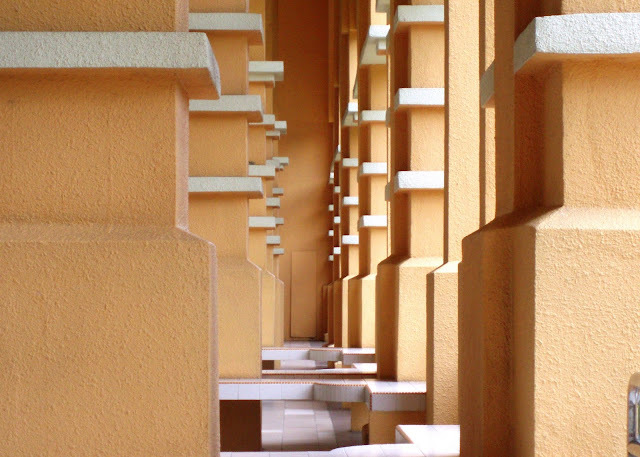 I am wondering what does this pattern mean & whether it is originated from local or Chinese architecture. 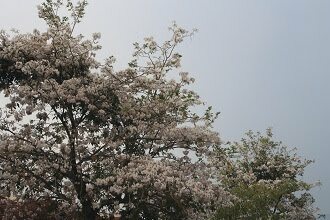 Flowers are blooming on the tree. 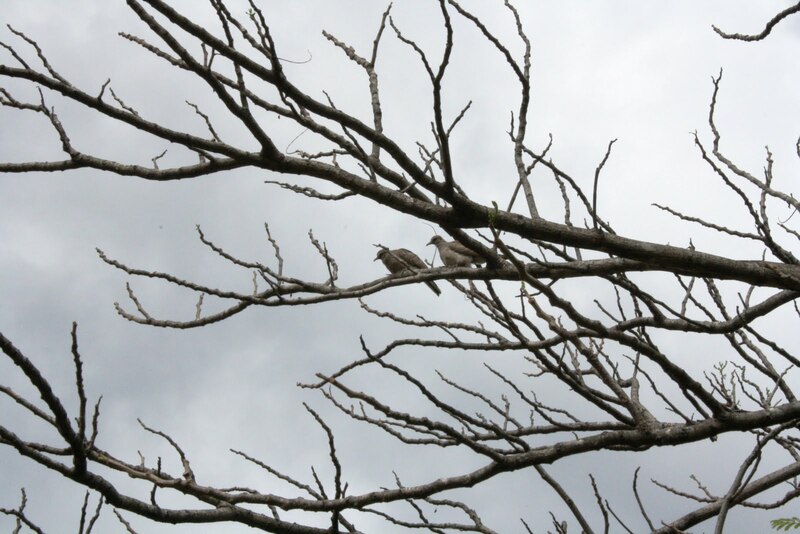 Anyway, the color is slightly down when seen during cloudy day. Over the last few days, layer of cloud has shaded the earth from burning sunlight & making it a comfortable weather. This is a rainy Sunday morning. I believe many would find this is just a nice & relaxing rest day which is cool & refreshing. The rain approaching city center from Kledang Mountain Range and slowly covering the limestone hill, Cheroh Hill along Anderson Road. The rainy days may prolong for some time as several neighbouring northern states are now stroke by heavy rain & flood. 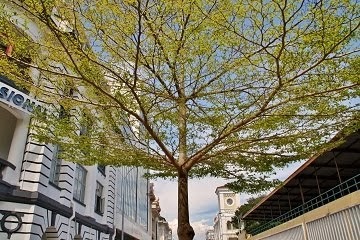 We do not see fancy decorated skysrapers in Ipoh. The high rise buidings are controlled at certain height for aviation safety and therefore no special landmark appear in the city skyline. 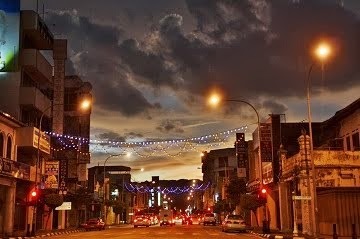 However, the night view of Ipoh still beautiful & charming. The piece of land near Kinta Free Trade Zone, right opposite the 5-storey Klebang Jaya flat, has been cleared recently for housing project. Plants have been chopped off & ground leveling work is on going. 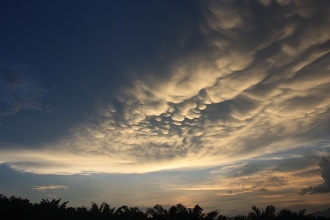 The sight is extended to the inner part of Klebang Restu. 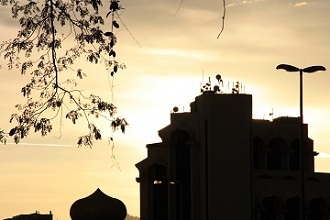 When driving towards north on Kuala Kangsar Road, someone who pass by the junction of Klebang Restu, Klebang Ria & Klebang Putra at night will easily find the lightened red dome of a mosque in Klebang Restu. The Greentown Federal Building is a complex to house many departments of Federal Government. It was once a crowded place upon its operation commencement. However, it was designed to fail the convenience for car drivers because of the extremely limited parking lot in & surrounding the complex. Later on, many departments moved out from this complex to their own building elsewhere and leaving here almost an empty shell, while those additional buildings are built big and beautiful with taxpayers' money. The corridor of Greentown Federal Building, once flooded by civilian, is now quiet. The weather is changing again. From the sudden stop of rainy days since three weeks ago, it became sunny and warm. 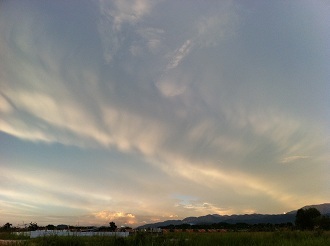 About two weeks later, there were several days turned out to be cloudy & sometimes raining. We thaught that were just few exceptional days during the warm season. However, the similar weather prolonged until today and I feel much more comfortable with the moderate humidity & temperature.